As the phone rings, it’s hard to tell if he’s sitting back in reflection, or preparing to spring off the desk into action. The ambiguity seems intentional. 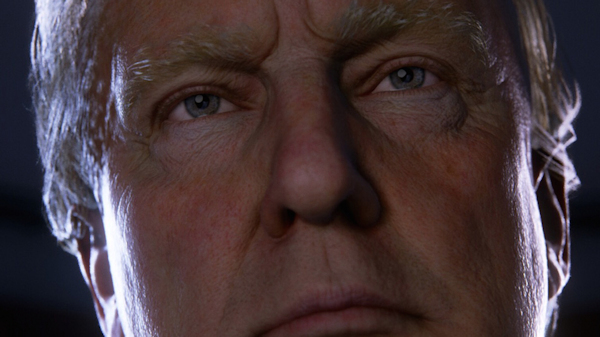 “We see Trump in VR as art,” co-creator John MacInnes explains. “A tableau vivant, in the American tradition of artists like Edward Hopper in painting, Gregory Crewdson and Cindy Sherman in photography.” Indeed, Wide Awake serves as a living picture — it’s as frozen as a painting, but a light in the player’s hand gives them some control over how the scene looks. And while the subject is frozen, the world around him isn’t. The ringing phone continues to add tension to the scene. Who is this new president? What is his reaction to a middle of the night emergency? The work doesn’t answer this question — it merely offers a view of public service the average citizen will never see. Someday soon, Donald Trump will be awoken by a midnight call and rush to the West Wing. He’ll be called upon to make life and death decisions most of us can scarcely imagine. The experience was actually created before the election, but was only released to the public on the Vive store on the dawn of Donald Trump’s inauguration. It has more impact this way, portraying a definite future instead of a potential one. It’s also an incredibly surreal experience to have just minutes after the President is sworn in.